Take advantage of what the season offers – right now I’m into rhubarb – and bake up this sweet-and-slightly-tart dessert. I used rhubarb from my 93-year-old uncle’s garden to make this dish extra special to me. 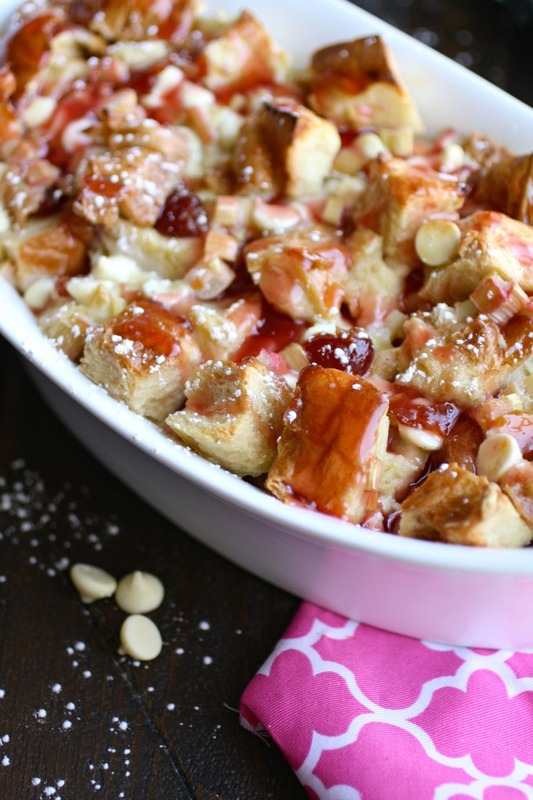 You can easily make Cherry-Rhubarb and White Chocolate Bread Pudding the final touch to your next springtime meal. I was in Ohio recently for a visit with my family. 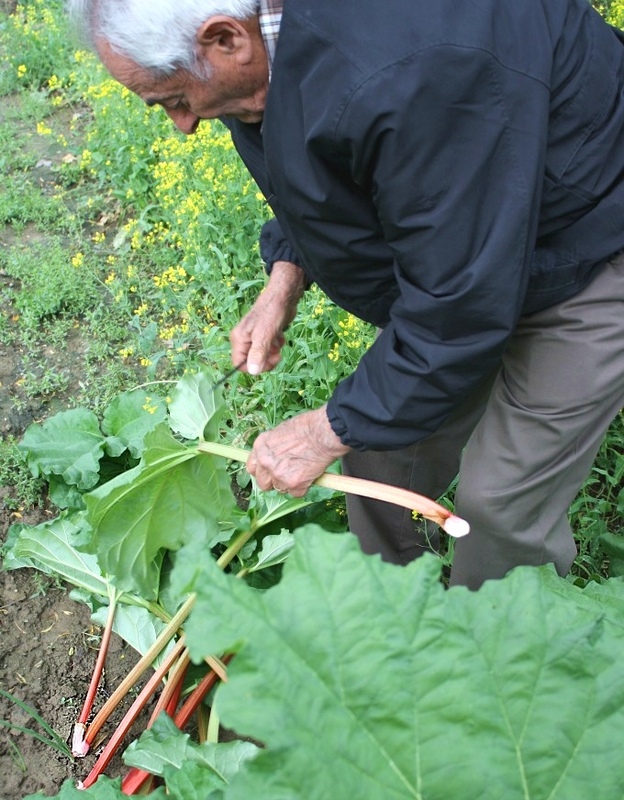 When my visit came to an end, my Uncle Tom sent me packing with a big bunch of rhubarb from his garden. When my uncle offers anything from his beautiful and vibrant backyard garden, you find room in your suitcase to tote it home. Each year he has a fabulous garden that he tends to after working hours (he’s a landscaper, not-yet retired at the age of 93 – amazing! ), and it’s always fun to figure out what to make from his bounty. I know I’ve already made a rhubarb dessert this season (Strawberry-Rhubarb Crumble for Two), but I couldn’t resist making another: Cherry-Rhubarb and White Chocolate Bread Pudding is a rich, sweet-tart treat that’s full of flavor and is easy to make. 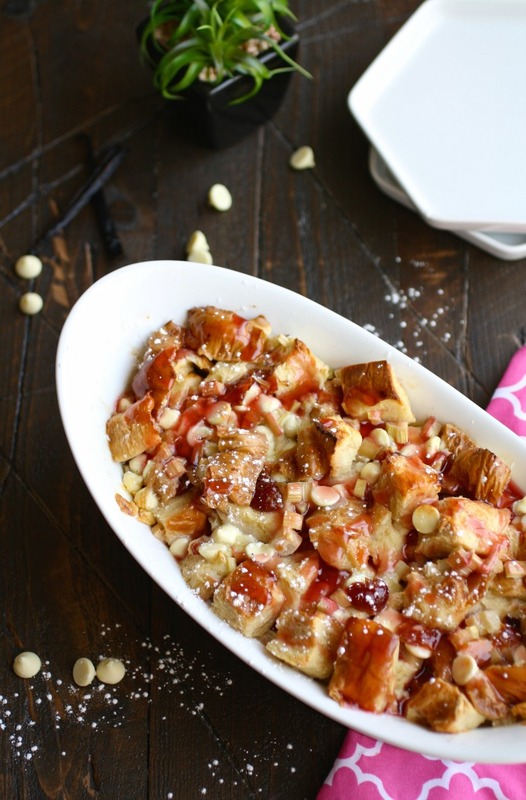 This treat is anything but dry or boring (like I used to think all bread pudding was)! I used challah bread to add to this dessert’s richness, and cherry preserves and white chocolate chips to balance out the tart rhubarb. What a great combo! I also made a quick sauce to drizzle over the top of the bread pudding, just for a little added color and, well, deliciousness. You may not have rhubarb straight from your family’s garden, but I still recommend you try Cherry-Rhubarb and White Chocolate Bread Pudding. Make it as the final, tasty touch to any sort of springtime meal! This is an elegant, yet easy-to-make dessert that is perfect to serve this spring. It's perfect for using up fresh rhubarb this time of year! Preheat the oven to 350 degrees F. Butter a 1-1/2-quart baking dish and set aside. Add the bread, 1-1/4 cups of the rhubarb, and the white chocolate chips to a large bowl. Toss and set aside. Add the milk, sugar, butter, the inside from 1/2 the vanilla bean pod, and 2 tablespoons of cherry preserves to a saucepan over low heat. Whisk to combine. Stir occasionally until the butter melts. Remove from the heat and allow to cool. When the mixture is cool, add the eggs and whisk to combine. Pour the mixture over the bread mixture and transfer to the baking dish. Bake for 30-40 minutes, or until the center of the mixture is set and the bread has turned golden. Remove from the oven and keep warm. Add the remaining rhubarb, 4 tablespoons of cherry preserves, the lemon juice, and the inside of the remaining vanilla bean to a saucepan over medium-high heat. Stir to combine. Add a teaspoon of water to a small bowl along with the cornstarch. Mix until smooth. When the mixture begins to bubble, add the cornstarch mixture and stir to combine. Reduce the heat, and cook for another minute or so, stirring. Remove the pan from the heat. The mixture should be slightly thickened. Strain the mixture through a fine mesh sieve and discard the remaining solid pieces. Drizzle the mixture over the warm bread pudding, sprinkle with confectioners’ sugar if you’d like, and serve immediately. What a great way to use rhubarb! I usually just have it in a crumble, but this looks amazing. Thanks, Dannii! Yes, me, too. This will be a nice new way to enjoy rhubarb! Ooo! Lucky! Hope you give this a try! Sounds perfectly yummy!! And it is soo Italian -- you can't leave an Italian household without them giving you to take with you. The bread pudding sounds and looks delicious. My father-in-law was a great fan of bread pudding -- I loved cooking for him because he was so very appreciative. Thank you for sharing. I loove bread pudding. Such an easy and versatile dessert! And I totally forgot rhubarb is in season again. Score! Cherries and rhubarbs are the best friends for spring! Your recipe will do the trick, looks wonderful and delicious! 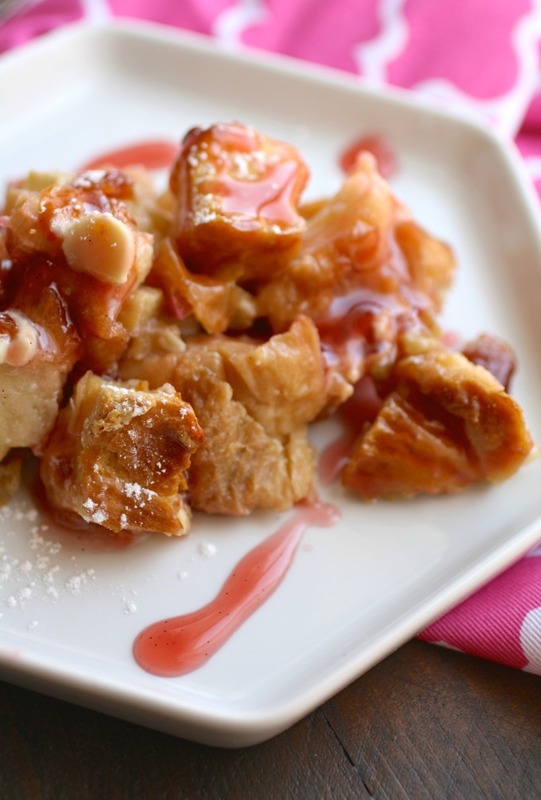 What a gorgeous dish and such a fun story to accompany this bread pudding! I love that your uncle is still gardening and that he sent you home with this rhubarb. And what a great use you found for it! Since I've lived in the Deep South my entire life, I've never actually *tried* rhubarb before because it's not readily available here. Clearly, I need to fix this. And soon! Thanks, Erin! Yes, my uncle is something to see - amazing! I hope you can get your hands on some rhubarb sometime soon! I know! Not just gardening, but landscaping...like for real! It's amazing! Thanks, Theresa! I love rhubarb, and this looks delish! But some of our family doesn't like cherries. Do you think this would taste good with strawberry preserves instead? Absolutely, Angie! The rhubarb (since it's tart) needs something sweet for balance, and strawberry preserves would be great, too! Hope you try it and enjoy! Put a nice port next to this... dreamy! That's an excellent idea, Rhiannon! Thank you! Well now I'm craving bread pudding!! Yum! :) Sorry/not sorry! Thanks for stopping by! I don't cook with rhubarb ever really. That needs to change. This looks great! I hadn't either until just recently! Hope you give it a go :) Thanks, Des! My Oh My…this is the PERFECT Father's Day brunch dish!! Absolutely fantastic!P.S, Envious of your uncle's garden! Great idea, Katerina! I know - you should see it! It's so amazing! this looks amazing! I can almost taste the tartness of rhubarb! Its one of my favorite flavors. This looks amazing, I cannot wait to make this! Yes, definitely, Kristen! Thanks so much! Rhubarb is an all-time favorite with my family and I have a feeling that this would disappear very quickly in our house. This bread pudding looks so yummy. I had some a month or so ago and it was a happy reminder that I LOVE bread pudding. By the way, your uncle sounds amazing. I am sure he has years of wisdom to pass down. Thanks so much, Michelle! Yes, for sure -- my uncle is also an amazing cook, and especially baker! Love it! This bread pudding looks so unique and delicious!! I love bread pudding so much that one time I ate an entire one in one sitting with just my sister to help me! It's obviously a personal favorite! oink oink! What a great use of fresh rhubarb. It looks delicious, and I am always looking for fun new ways to use it! I know, right?? Hope you give this one a try, too! I love the combination of flavors going on here! I'll bet the challah bread just sends it over the top! Ahhh...your beautiful bread pudding looks so scrumptious! I wish I could step into your photo, take a fork and enjoy it's deliciousness. It's so sweet that your uncle continues to work as a landscaper and maintain a beautiful garden full of bounty he is willing to share. That is completely awesome. I bet his love for his plants make the dishes you bake with them taste all the more wonderful. Yes, most definitely, Denay! Thanks so much for stopping by! This bread pudding recipe looks so good! Thank you for sharing, I can't wait to try it! This looks really delicious! Those photos make it so tempting. I love this combination of flavors! Bread pudding is a dessert I grew up with but I never would have thought to make a fruity version of it - I love this idea. Thanks, Joanie! I've only made it a few times, but have come to really love it!